In Japanese culture, life after death is believed to exist. As such, Japanese people honour the dead by praying for the spirits of their ancestors to be privileged in obtaining Buddhahood without having to endure any anguish during Bon Odori as the people believe the spirits would visit their homes during the ‘Obon’ period. The name ‘Bon Odori’ refers to a dance held during the ‘Obon’, as depicted in Japanese folk art. This is a dance that was originally meant for sending spirits to the other world. Bon Odori, also known as Bon Dance or Bon Festival is a popular folk entertainment festival celebrated in Japan and it is now celebrated to enliven summer festivals. Huge Bon Odori events are usually held by the community’s government while towns and local districts will organise their own events. The dance is usually accompanied by lyrics depicting actions such as “rice harvesting” and “scooping mud” while in some parts of Japan, dancers even wear masks as they believe that the spirits of the dead are dancing among them. The dance moves are repetitive and easy to follow, thus enabling the Japanese people and even foreigners to remember the moves while participating in the joyous occasion. Participants of the dance are free to wear anything they like but as the choreography is based on dancers wearing the yukata (Japanese robe), participants are more likely to put on a similar costume to join in the fun. There are two types of Bon Odori dances, the dento-odori; which is traditional dancing with strong ties in traditional folk culture. Dancers would dance along to songs or live music played by flutes, samisen (Japanese banjo) or drums. 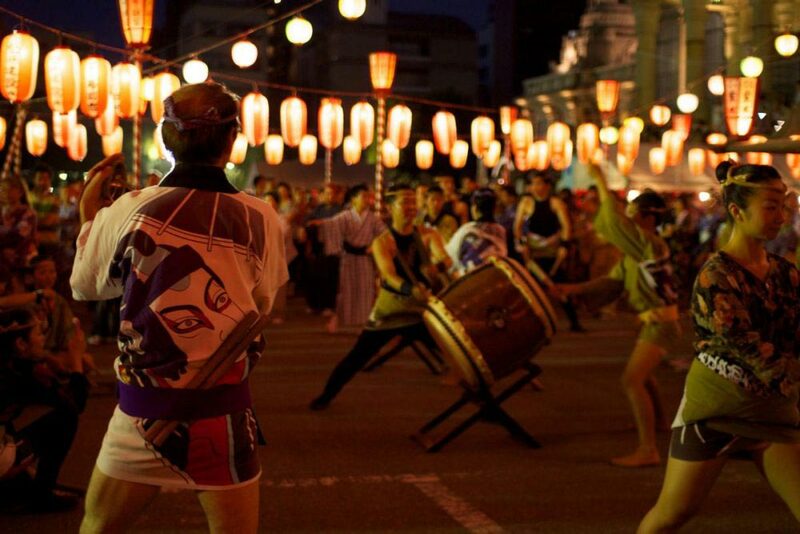 On the other hand, the minyo-odori means dancing with folk songs and it was created during the end of World War II. This dance is slowly gaining popularity in modern culture and participants will dance to the music called ondo in a circle around a tower at parks or plazas. Although Bon Odori dances vary from area to area all around Japan, the main aim is to enjoy the all-night dances, beautiful music and also the wonderful atmosphere of this summer custom.